2013 marks Bonnie and Fred’s 60th Wedding Anniversary. 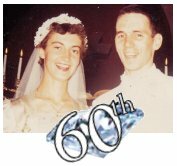 $6 million 60th Wedding Anniversary Diamond Jubilee Endowment Fund. "We are encouraging everyone to fundraise toward this fund." and resources required to carry on their work. Interest from the endowment will provide a solid base for Child Haven’s continuing operations. There will certainly still be a need for on-going fund-raising, but with a secure foundation to depend upon. This will no doubt be most re-assuring to Fred and Bonnie, as well as to the thousands who are impacted by Child Haven’s Homes and programs. It is vital that every Child Haven supporter joins us to help raise the funds needed to set up our $6 Million 60th Wedding Anniversary Diamond Jubilee Endowment Fund. Please give as generously as you are able. During the 60 years of their marriage, Bonnie and Fred raised their own 21 children, 19 adopted from around the world. They have also nurtured and provided loving care for thousands of formerly destitute children and women in India, Nepal, Tibet and Bangladesh. With their guidance, over the past years, we have assembled a future transition team which is intimately familiar with the people, philosophy and inner-workings which make Child Haven truly unique and effective. With your help, we can secure the future for Child Haven and the children in need of our love and care. We are encouraging everyone to fundraise toward this fund.